The first time I ever saw Star Trek was in a re-run on Channel 2 at 6 p.m. My parents had recently taken me to visit a comic book store for the very first time, and behind the counter had been a bunch of Star Trek books and memorabilia. Whether or not that was as a tie-in to push those repeats on Channel 2, I don’t know. I was only six years old. I hadn’t heard of synergy. I just knew that that first episode I saw, fittingly enough “The Trouble with Tribbles,” had me hooked. Nobody, not even Batman (broadcasting two hours earlier on that same Bat-channel), was as cool as Captain Kirk. 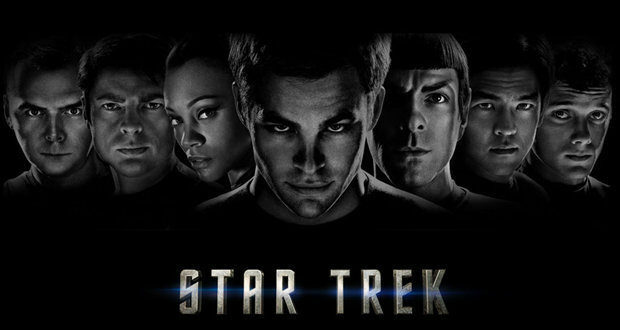 Sitting down for J.J. Abrams’ reboot of Gene Roddenberry’s franchise, I got that feeling again. Star Trek isn’t fit only for six year olds, but it does recapture that excitement, that sheer joy at watching the crew of the Starship Enterprise boldly going where no one has gone before. Even if, yeah, we have kind of been here before. It’s just never been this shiny, paying homage to everything that has gone before while staking out a whole new claim. Much mockery has been made of Abrams’ oft use of lens flares, but as an artistic choice, it really goes far to subtly offer us hope that the future will be bright. Something new and exciting may very well be happening just over the horizon, and if we can maintain ourselves with the nobility of Starfleet, we may just get there. That starts with the sacrifice of two Captains – though of course you’re going to focus on George Kirk (Chris Hemsworth). Don’t lose sight that two fine officers save the crew of the U.S.S. Kelvin, the first being Captain Robau (Faran Tahir, one of Iron Man’s villains). Both men make tense decisions in facing the unexpected threat of the Romulan commander Nero (Eric Bana), and in the first gripping three minutes of this film, you see the best of humanity. 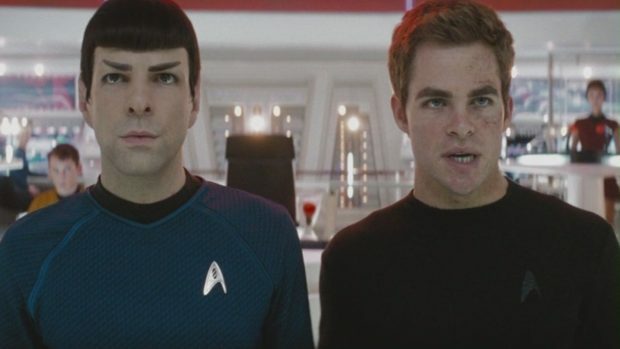 And then Star Trek becomes an origin story, of sorts, of Kirk (Chris Pine) and Spock (Zachary Quinto): who they are and how they came to be. Except throughout this telling, things ring somehow …wrong, but in a right way. The very presence of Nero, it seems, has altered history, and this isn’t our Kirk and Spock. Despite 87 television episodes (plus the animated series) and seven movies, their destinies really aren’t written. Though we may be confident we know how it will end, Abrams and his screenwriters Roberto Orci and Alex Kurtzmann have given us enough room to doubt. 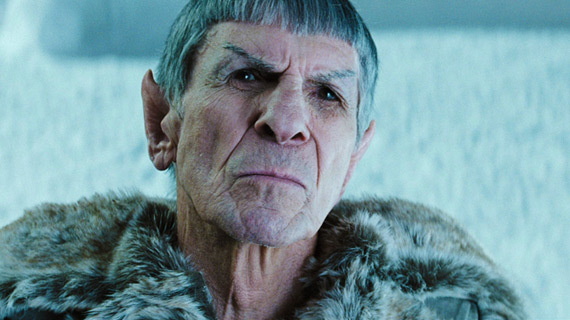 Once again, we have suspense in a Star Trek movie, and not once does it feel cheap. That’s not that this adventure is flawless. Though dictated by some time-travel necessity, it seems a little odd that Nero and his crew stay completely inactive for twenty-five years between attacks. For that matter, Bana’s performance never transcends the character’s brooding to stand out as a memorable villain. He’s strictly working-class, a Romulan miner, but twenty-five years of hatred don’t do anything to hone him. As part of the origin story, it feels odd to have Chekov (Anton Yelchin) shoe-horned in, but the script ends up giving him more to do than in the original series – and offers specific enough characterization to make him a valuable part of the ensemble. Though not everyone gets a huge amount of screen time, they all get enough focus to set them apart with more than just a nod, with Uhura (Zoe Saldana) in particular becoming a far more vivid character than she ever was in any episodes. The majority of the time, of course, goes to Kirk and Spock, and both actors recreate the roles without resorting to impersonation. Pine has his own swagger, and though no one could really replace William Shatner, the younger actor fills Kirk’s shoes well enough to make you set the older aside. As a younger Spock, Quinto has a little more reign to let emotions bubble under the surface than Leonard Nimoy did, but in a weird way, the two actors feed off of each other to make them believably the same character. 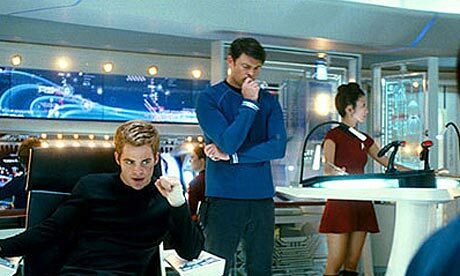 For me, the big discovery is Karl Urban as Doctor McCoy. His voice isn’t nearly as whiskey-gravelled as DeForest Kelley’s was, but it’s on its way. He has the rhythms down, but also puts his own spin on the delivery. This should be the role that breaks Urban out of B-level action star status and into some more serious work. After watching Star Trek, I wanted to immediately catch it on a re-run, suddenly giddy about the 23rd Century once more. I’d like more of that bright and shiny future now, please.